This is a great light, my favorite function is the switch does not need multiple presses to power off and it switches on at the same brightness. FENIX IS NUMBER ONE IN AN ERA OF EDC FLASHLIGHTS. VALUE, QUALITY, WARRANTY TOPS ALL OTHERS. DISCARDED MY UNRELIABLE LIGHTS AND REPLACED WITH FENIX AND THEIR GREAT SELECTION FOR MANY APPLICATIONS. ONE STOP SHOPPING AND SUPER FAST DELIVERY. SUPER PLEASED! Love mine very durable very bright long run time. Used for horseback hunting. I’m gout get a couple more for my kids. I’ve had this light for almost a year now. It’s been reliable, but my biggest complaint is that the straps are very smooth, and the headlamp falls off very easily. This is especially true when working underneath a vehicle. It just slips right off. I’d settle for some sort of chin strap, but no one seems to make one for headlamps. Other than that, the light has been good. The 400 lumen claim seems a little high since it doesn’t seem much brighter than one of my older lights that was around 200 lumens. The battery pack is well designed, and seals up nicely. The gold plated contacts are a nice touch in case of battery leakage. I have had my HP15 for 4 months. I use it frequently at night for wildlife surveys. It is a reliable headlamp. To date I have not had an issue with the tilt function on this headlamp. On my HP11 I had it snap a couple of times. The burst mode on the HP15 is effective but I have never really needed it. Its just fun to push sometimes. I do wish this light came with a diffuser as the HP11 did. 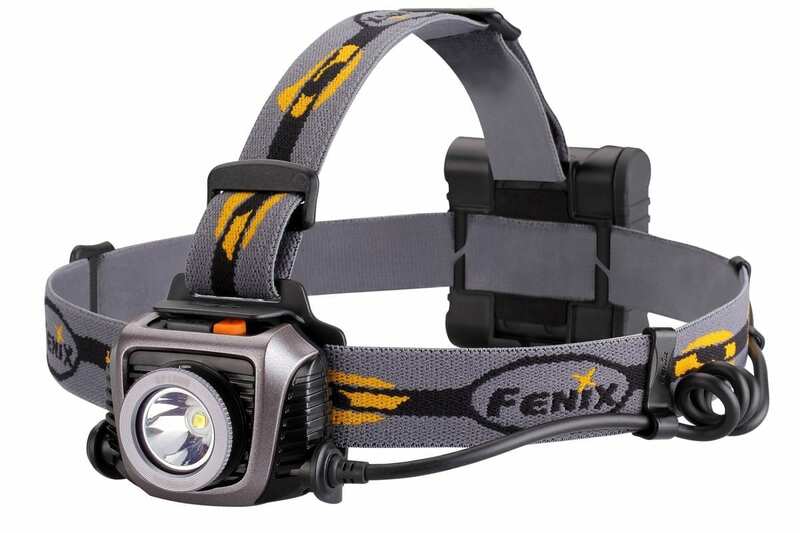 Overall I would recommend this headlamp but my favorite model has been the HP11. I don’t like that I have to hold the power button in order to turn the light off. This sounds petty but is slightly annoying when I need the light off in an instant. Especially because only tapping the power button will change to power output of the light rather than killing the power. I bought mine several months ago & wanted to get used to it for a while before reviewing. Versatile, well made, dependable unit. easy to use, 2 buttons one is on/off when held down briefly (1/2 second) & changes power when tapped quickly. There is enough difference so you hardly ever get the wrong function. Second button accesses a lighthouse level high intensity beam instantly while remembering the setting in use before. It auto returns from the super high after a short period. Holding it down for 3 seconds turns on an automatic SOS flasher at a 50 lumens power that will signal for a long time. Pressing the other button goes directly into high power “burst mode”. Takes commonly available “AA” batteries, either regular or Ni MH rechargeable. Its listed as “Heavy splash proof” but not “waterproof as in submersible. Beam is fixed, the older HP15 had a diffuser, that is no longer an option. Not terrible as the beam is well spread & even. The coiled wire is stiff, it tries to twist @ 90 degrees no matter how you assemble the clip. The SOS is terribly slow to send, I’m not sure why its not so much SOS as S–O–S. Nice versatile dependable light with enough settings to either get long battery run time, blinding brightness or something in between. The Burst mode is great for looking “out there” in the outdoors where the 50 Lumen setting is more than adequate for looking about you indoors (or in tent) or close (30 feet or) so for night hiking..
Would I buy another or suggest to a friend? Absolutely YES to both, in fact I have a couple of times.